When I dismantled the display of Axel’s Numbered Agates, I also took down some of the memorabilia that was above the rock shelves. Below is a photo taken by W.H. Hadley of Royal Oak, MI. It shows the original museum sometime around the late 1960s. Notice that there is a large tree to the west of the museum, which is no longer there. Also there is a different house to the east of the museum. 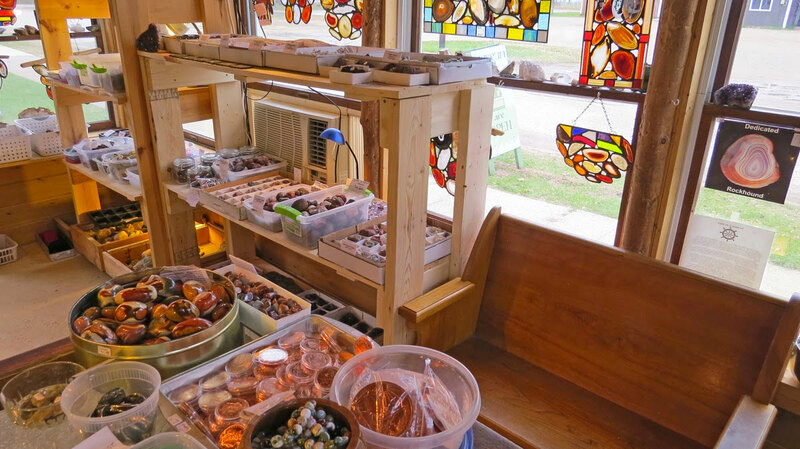 On the top of the frame, Axel labeled the photo: Gitche Gumee Agate Shop, Mineral and Historical Museum. The second photo included this month is one of Axel walking in the July 4th parade. The picture is a little out of focus, but it is still a kick to remember Axel in that coat. As many of you may remember, he always wore the 1895 bear coat in the parade. I have honored that tradition many years. I haven’t decided if I am going to do so this year. I’ll wait to see what the weather is like.